Islamabad: November 20, 2018: Capital Development Authority (CDA)’s and Islamabad District Administration (ICT)’s massive operation against the illegal encroachments / constructions on the right of way of G.T Road remained continue on Tuesday. During the second day of the operation, CDA has retrieved more 225 kanals of state land from illegal occupants. 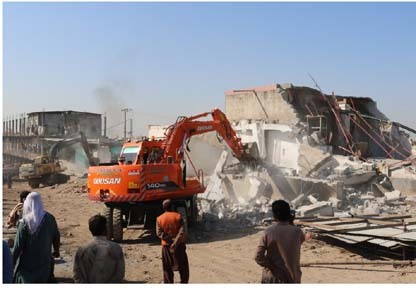 During the anti-encroachment operation being carried out at G.T Road several massive constructions including plazas, Showrooms, markets and boundary walls constructed on several kanals of state land were demolished. This operation is being carried out against the elements who have been occupying state land illegally. These elements remain hindrance in eliminating encroachments. However, in accordance with the policy of the present Government, all encroachments and illegal constructions on state land are being demolished without any discrimination. Action against such influential encroachers /elements would remain continue without any fear or favour. During the second day of operation, illegal encroachments / constructions from one (01) more kilometer on the right of way of G.T Road, from Tarnol phatak towards Peshawar, were completely demolished. The operation was participated by entire staff and officers of Enforcement Directorate, relevant officers and staff of ICT, National Highways Authority (NHA), officers of Planning Wing of CDA, Land and Rehabilitation Directorate, Revenue staff ICT. While heavy contingent of police was deployed and in order to, cater any unpleasant situation Counter Terrorism Force and Anti-Roit Unit of ICT Police with the backup of Rangers were also deployed during the operation. Furthermore, heavy machinery of MPO Directorate and other formations of CDA were also utilized during the operation in addition to two (02) excavators provided by the NHA. On the second day of the operation, 185 illegal shops, 05 chapper hotels, 07 Shanwari hotels, one (01) Stairs, 04 Gates, 02 Containers, 10 Washrooms, 10 Boundary Walls, 05 Kabaari Shops, and 03 show rooms were demolished and 225 kanals state land has been retrieved from illegal occupants. It is pertinent to mention here that operation was conducted after the demarcation carried out by the Revenue Staff of CDA, ICT and NHA. During the operation which was initiated on Monday against the illegal encroachments on the right of way both sides the road would be demolished.